It was clear to the entire audience that Narumi Nambu had just received the surprise of her life. 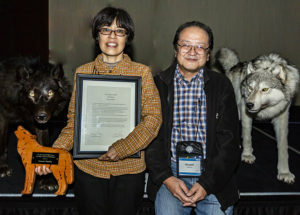 In a packed hotel ballroom in Minneapolis, Minnesota USA during the International Wolf Symposium, Nambu had just been named the recipient of the Who Speaks for Wolf Award presented by the International Wolf Center. Nambu earned the award for her work with the Japan Wolf Association. She’s an active member of the association, which aims to have wolves reintroduced in Japan. Nambu has translated multiple wolf books into Japanese, researches Japanese attitudes about wolves and their possible reintroduction there, speaks at conferences and publishes in a variety of forums. This is the first time in International Wolf Center history that the Who Speaks for Wolf Award has been given to a recipient from Asia. The Center’s Executive Director, Rob Schultz, was thrilled to see Nambu earn the award. The Japan Wolf Association (JWA) was formed in 1993. The JWA estimates that animals with no natural predators left in Japan, mostly sika deer and wild boar, have caused the equivalent of $1.8 billion in agricultural and forestry damage to date. Preserving the environment for future generations in Japan motivates Nambu to continue her efforts for wolf reintroduction. Nambu was quick to point out that she’s one small part of a big organization working hard at reintroducing wolves in Japan. The annual “Who Speaks for Wolf” award is given by the International Wolf Center to an individual, who has made exceptional contributions to wolf education, by teaching people how the wolf lives and by placing the wolf in the broader context of humankind’s relationship to nature. THE INTERNATIONAL WOLF CENTER, founded in 1985, is known worldwide as the premier source for wolf information and education. The mission of the Center is to advance the survival of wolf populations by teaching about wolves, their relationship to wildlands and the human role in their future. The Center educates through its website, its ambassador wolves, museumexhibits, educational outreach programs, International Wolf magazine, and a beautiful interpretive center in Ely, Minnesota.